A few weeks ago, an Etsy customer wrote me a message asking for a bouquet for her nautical themed wedding. 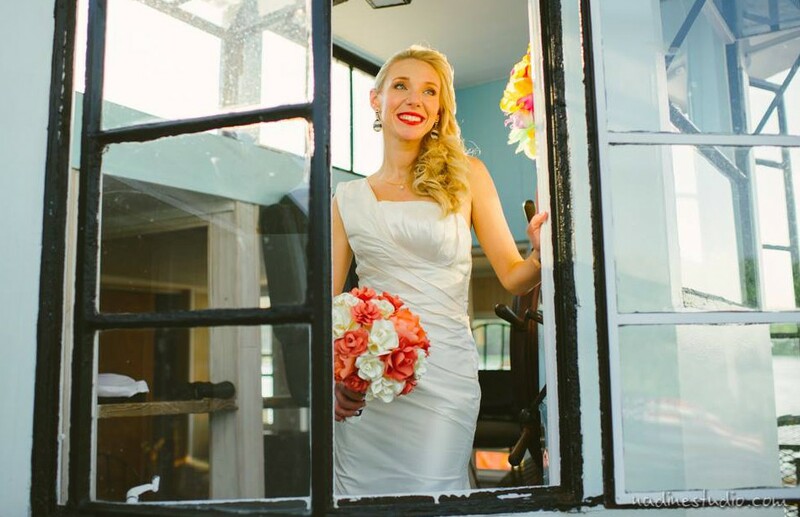 She wanted a large bouquet in whites and coral tones, with a mix of flower varietals. She also asked for a coordinating boutonniere. We went with peonies and roses, and I think the peonies add some more dimension to the bouquet. She asked for a navy and white striped stem wrap, so I did an ivory satin base with a thinner navy grosgrain spiraling around. The pearl accents and rope detail really complete the nautical, preppy look! One of my favorite tips to give couples when they're planning a big wedding reception is to reuse the flowers from the ceremony at the reception. Flowers tend to be one of the most expensive elements of decor, and if you can move alter arrangements and pew decor to the reception venue and use them as centerpieces or to fill out your accessory tables, you'll save a lot of money. So frequently when I'm coordinating a wedding, I'll ask the bride if she has a plan for the flowers and bouquets after the ceremony, and she looks at me like I have ten heads. My bouquets are sized to fit really nicely in a short vase, mason jar, or even just a pretty glass (shown below). This is also a great way to display your paper bouquet after the wedding! Your bridesmaids (and you) don't want to carry around bouquets all night, and if you lay them down on a table, there's a greater possibility of them getting damaged (especially if they're real flowers) or getting lost by the end of the night. If you plan to use the bouquets as decoration at the reception, you and your girls will know exactly where to find them at the end of the night, and they're much more likely to stay in good condition! The listing is live on the Etsy shop! As always, the flowers shown in the shop and on the blog are just examples of what we can do. If you have something in mind that you don't see here or in the shop, just ask! The possibilities with different color and flower combinations are endless!